So, Susie and I are on The Austerity Plan. It’s a new diet I came up with. It’s got an interesting twist: we can eat whatever we want, but there’s a terrible price. My buddy Darren spilled root beer on his semicolon key, and as I started to explain to him how to fix it, I realized that this knowledge could help countless other sticky spillers. So, here’s how to remove a key from your keyboard, as taught to me by tech support god Ron. So, have I ever told you, dear reader, about the horse shoe shaped birthmark I have? Well, it spread some luck to my mom this weekend. She was in town just for a few days, and was taking the Airporter bus back to the airport. 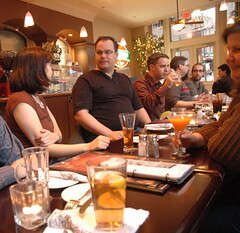 Thursday night, I went to the monthly blogger meetup in Vancouver. Hop Studios is official sponsoring the Vancouver Blogger Meetups for the next six months, and I was glad there was a diverse crowd. So, I just took a short-term teaching position at BCIT. I’ll be teaching a course called “Dreamweaver MX Advanced / Database Driven Websites” as part of the New Media Design program. It was a little spooky how I got the job. Susie and I had dinner out last night at Hapa Izakaya to celebrate our anniversary. Nine years. We’re just three years away from earning a high school diploma in marriage. I met my friend Mike the other evening for coffee, then we were going to head to a movie. We were on the wrong side of downtown, and he’d just bought a new helmet for his motorbike. I so rarely do online quizzes, but this one caught my eye. It has questions like: “Morals are socially constructed” and “Man is condemned to be free.” Agree or disagree? How much? 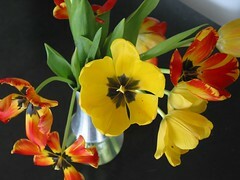 Today, there was a sign on Anya’s flower selling stall: she’ll be gone in about a week, closing her colorful booth. I asked her why, and she said no reason, she just got tired of being a flower seller. At a conference in New York, I meet an amazingly humble person. Paradoxically, he makes a huge impression on me. I went tonight to see the band at crowded, hip and service-poor bar The Whip. The band was great—they’re managed by Kris Krug. I, of course, forgot to get the name of the band. But when I find it, I’ll let you know. My apartment has a pond outside the back door, and that pond has a regular guest: A Canadian Goose. Yeah, the cat gets a lot of ink, but what can I say, she’s newsworthy. So, here’s a few other adventures our cat had while we were gone. I was reading a Computerworld article about a dentist who uses an ipod to back up his patient data, and starting thinking… how much storage space is available on iPods right now? You’ll be amazed.